So she penned the screenplay for “Fantastic Beasts and Where to Find Them”. The script was based on a standalone book she wrote in 2001. That book is essentially an encyclopedia of the various creatures she concocted to thrive within the Wizarding World. For the film, she took that premise and crafted an entire story around it, led by Eddie Redmayne’s Doctor Dolittle with a wand – Newt Scamander. “Fantastic Beasts” did something none of the “Potter” films were able to do. It won an Academy Award (for Costume Design). But it also made less at the box office than each of Harry’s adventures. Delving into the plot of “Fantastic Beasts: The Crimes of Grindelwald” would take nearly all of the movie’s two-hour, 15-minute runtime. In short, it’s the continuing adventures of Scamander and his small group of pals, who now face the threat of the evil Grindelwald (played by Johnny Depp). It’s the post WWI period. 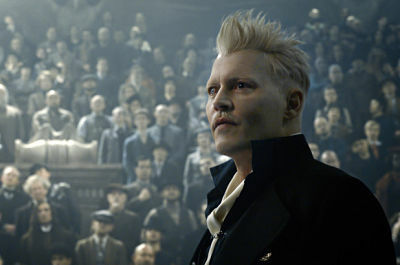 Grindelwald wants to end the peace between the wizards/warlocks – and the muggles, matlocks, huffenpuffs, HR Puffenstuffs and whatever else regular people are called – and take over the world. “Crimes of Grindelwald” is a much more serious and sophisticated treatment than the first “Fantastic Beasts” (which featured Oscar-winning Redmayne’s infamous rhinoceros scene). That makes it more tolerable, but only slightly more satisfying. And that’s because of Rowling’s overly explanatory and complex script. You can’t help but feel that she’s making all this up as she goes along. And when the narrative hits a snag, she simply has all the characters stop in their tracks and explain to each other (and us) what’s going on. And Rowling packs this installment with plenty of random “Harry Potter” references. This is done simply to tantalize diehard fans of that more popular series. She also takes full advantage of the absurd fantasy genre. When characters get into tricky situations or are written into a corner, Rowling simply waves her magic wand – and it’s onto the next scene. Since this is a fantastical soap opera, the performances aren’t a high priority. As expected, Depp and Jude Law – as a young Dumbledore – do the best work. It’s the technical aspects of “Crimes of Grindelwald” that stand out, including the visuals and (once again) Colleen Atwood’s costumes. The last 20 minutes predictably set the stage for the third “Fantastic Beasts”, likely two years away. But can this saga sustain interest for a reported total of five films? If Rowling remains in control she could easily keep this going for another decade. 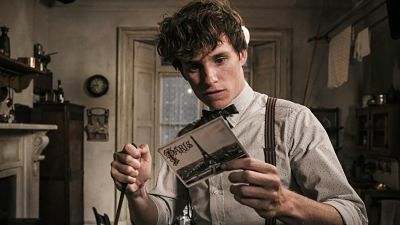 If enough Potterheads stay connected with Newt & Co. this series could even reach the number of “Harry” films. Hopefully, by that time, I’ll have my own magic wand, so I can conveniently disappear when asked to review them. On The Official LCJ Report Card, “Fantastic Beasts: The Crimes of Grindelwald” gets a C-.